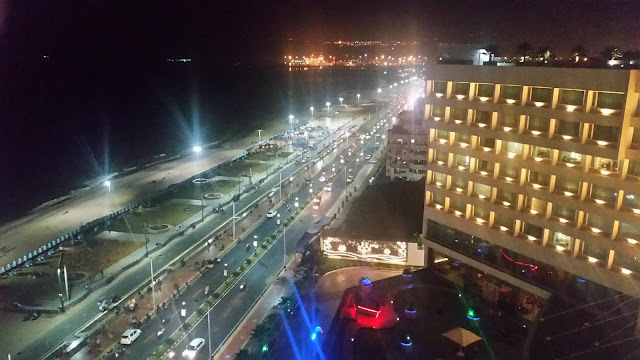 Against this backdrop, Kanak, the Indian specialty restaurant at The Trident has announced a promotion aptly called “Incredible Cuisines of India”. The aim of the festival is precisely to bring to the public eye delicacies from the lesser known cuisines of India. I was happy to be invited to a preview of the festival and looked forward to the culinary experience. The menu had items from a wide range of cuisines, literally from Jammu to Kanyakumari as well as from Arunachal in the North-East. This was a tasting session for bloggers and what I liked was that the items served were not too many. 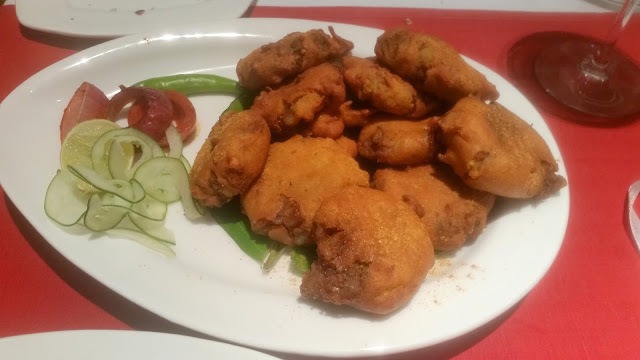 The first snack to arrive at the table was Aloo Debarre from Jammu, flat patties of potato with onions, green chillies coated with besan and fried. The dish which is quite close in taste to the Bengali aloo chop, was served with a delicious tamarind and radish chutney. From Jammu, we straight went to the southern tip of India, trying out Thattai from Kanyakumari. This was a crisp rice flour and daal based fried snack which was served with coconut chutney. The non-vegetarian dish of the day was Bhopali Keema Ka Seekh, a seekh kabab where khoya is added to mutton mince to make the kabab soft. 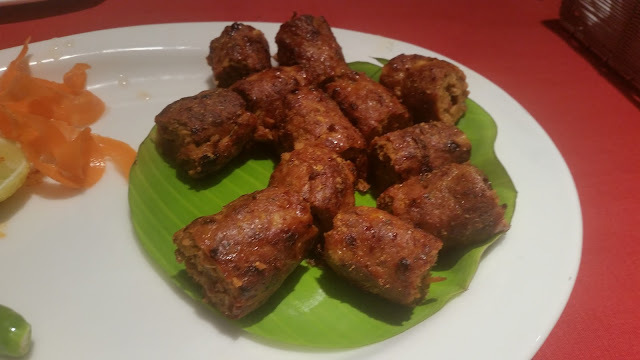 Among the royal cuisines, Bhopal stands out with some sublime meat dishes which are delicious with subtle use of spices – this was no exception. The main course also had quite a contribution from the Jammu region. Ambal, a mustard oil based pumpkin dish was tangy as well as sweet due to infusion of tamarind and jaggery in the gravy. I had it with rotis, but later thought it would have gone better with rice. Tawa Chicken was another item served from this region. 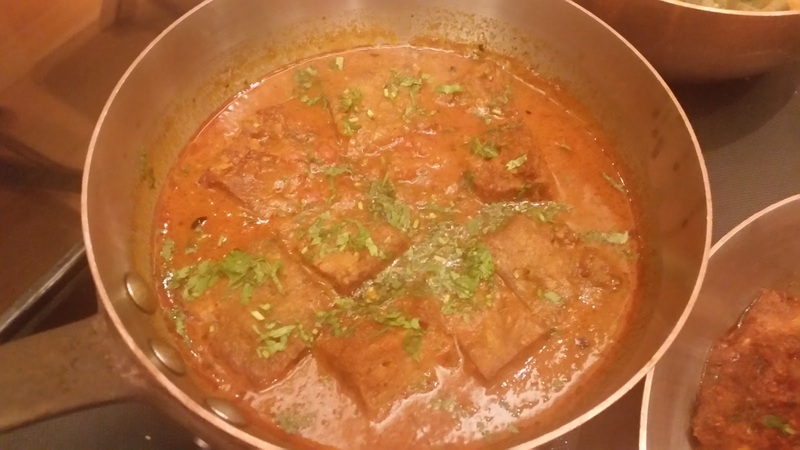 Mutton Kolhapuri was among the few dishes in the menu which is already quite popular. The spicy lamb curry lived up to its reputation and went brilliantly with the soft rotis. I also tried some of this dish with Kanika, a fragrant and sweet pulav from Odisha which is supposed to be part of bhog menu of Lord Jagannath at the Puri temple. The rice was an example of how awesome some of the dishes in the Odia cuisine are, and leaves you wondering why this cuisine is so under-marketed even in India. The pick of the main courses was Jan, a smoked chicken broth from Arunachal with lots of vegetables and very little spice. This was soul food and I devoured sumptuous quantities with steamed rice. When you talk about recipes from Bihar, the first one that comes to mind is Litti Chokha. 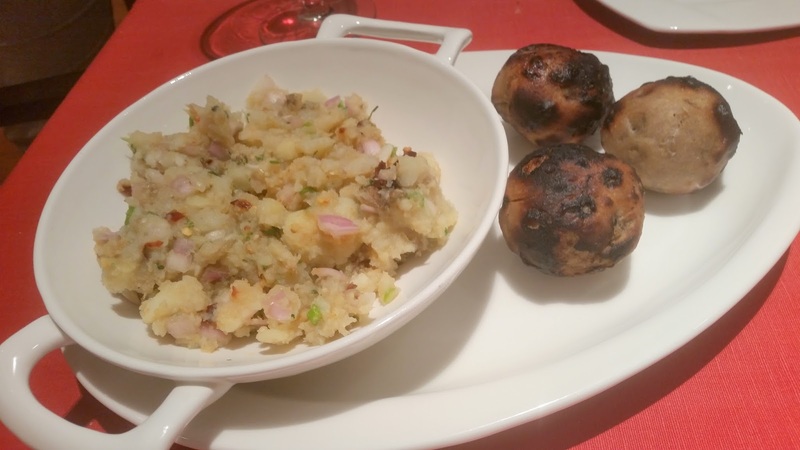 The mashed potato with onions, chillies with a strong flavour of mustard oil is popular all over Eastern region. It was good, but I have had better litties (wheat dumplings) than the ones served on the day. 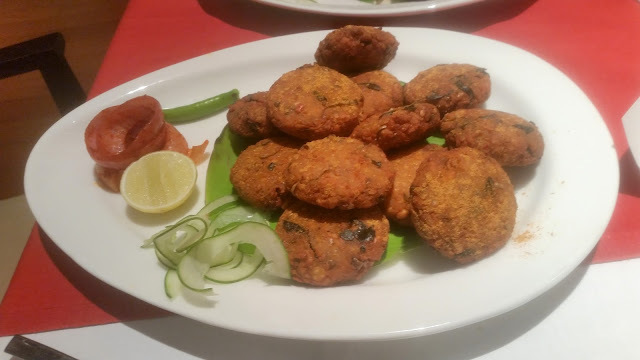 Chakke Ki Sabji, a popular dish from Rajasthan and Madhya Pradesh was another item on the menu. I liked the taste of the curry in this case and paired it with Masala Poori, again a Bihar specialty where puris were stuffed with a peas based masala. Finally, it was time for desserts. Aficionados of Indian desserts drool over Chhena Poda – the signature cheesecake from Odisha. Many have tried making this sweet in Hyderabad, but it has never worked out. Some blame it on weather, some on the variety of milk. 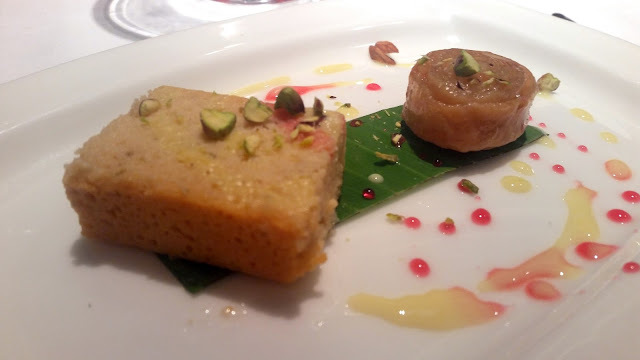 The Chhena Poda served here was also not up to the mark, it tasted more like sandesh. However, the Andhra Kaja served alongside was delicious. The efforts of the team at Trident to present delicacies from less popular Indian cuisines is indeed commendable. Most of the dishes tasted extremely good. I had tasted a few of these recipes before, and most of them here were quite authentic. 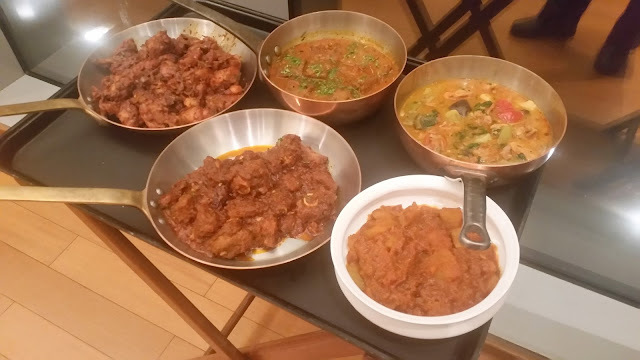 For a food lover who likes to experiment with new cuisines, the festival gives a good opportunity to try out dishes from diverse Indian cuisines. 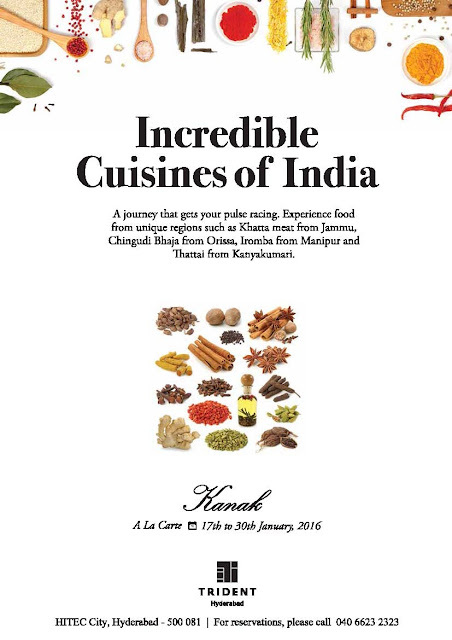 The a-la-carte festival is on till 30th January. Unusual dishes. I would love to try them. 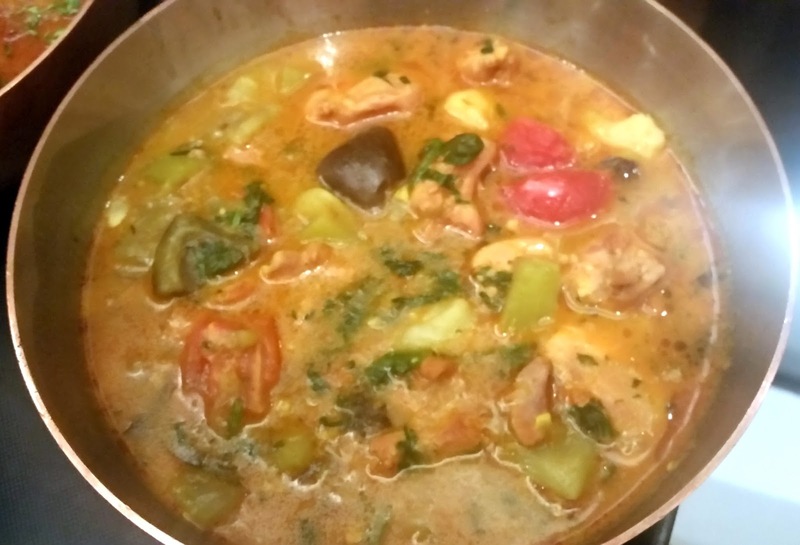 Specially Jan - the stew from Arunachal Pradesh.